Just one runner for Friday with the lightly raced Prince Of Arran resuming at Bendigo. Prince Of Arran has not raced since finishing seventh at Listed level at Flemington in November after winning his maiden at Benalla over 1606m. The three-year-old son of Nadeem has progressed physically with the spell and has pleased Mike Moroney since his return. “He’s really pleased us this preparation,” Moroney said. “He is beginning to figure things out and is doing well. 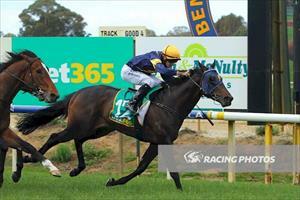 “His jumpouts have been excellent and he’s drawn well in two after scratchings however, he has struck a decent field. Prince Of Arran runs in race six, the Class I Handicap over 1400m with Patrick Moloney to ride.